With millions of dollars flowing through Governor Andrew Cuomo’s competitive economic development initiatives, folks who make their living in the Capital Region through creative means decided they wanted to get a stab at those funds, too. The Governor divided the state into several economic regions. Warren, Washington and Saratoga Counties are part of the Capital Region, which extends from through Albany, Schenectady and Troy, all the way south to Columbia and Greene Counties. How does such a far-flung region make its case? With a common message, suggests Maureen Sager. She’s the project director of Upstate Alliance for the Creative Economy — also known as ACE. 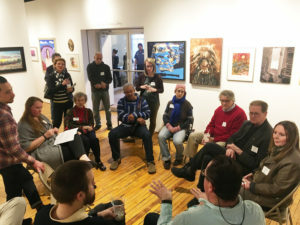 Most recently here in Glens Falls, the organization put together a gathering of artistic freelancers, in conjunction with the Spark Freelancers Union. Creative Economy includes Web designers, architects — “even you, in the newspaper business, writing,” she tells a reporter. The group recently added brewers, culinary artists and artisanal agriculture. Can the definition get too broad? Ms. Sager, who moved to Saratoga Springs to raise her young family after a career working at MTV Industries, among others, was one of the original people who put together the ACE initiative, about four years ago. Tom Lloyd of Adirondack Studios, which fabricates theatrical scenery and design elements for such diverse clients as amusement parks and grocery stores, was another. “It’s about the intersection of creative arts and economy,” Ms. Sager asserts. “There he is, Tom, with 130 jobs in the middle of Argyle, all based on creative work.” Others in on the ground level included such heavy hitters as Philip Morris of Proctors Theater in Schenectady. The first thing the group did was commission the report that asserts those 31,000 jobs in the creative industries — a way of earning your place in line as the Governor’s office considers competitive funding through its Upstate Revitalization Initiative, Regional Economic Development Councils, Consolidated Funding Applications — an alphabet soup of opportunities, with real money at stake. ‘Rap session’ — The gathering included free time to network, and small-circle discussions on project management. It worked. Of 300 applications country-wide, the Capital Region received the $1 million. The project was to put artistic light shows into the windows of vacant buildings in all three cities, with the intent to highlight issues of downtown blight. It went live in October 2016. “It was a massive undertaking,” Ms. Sager says. It was also an economic boon, calling for the design and manufacture of the physical lights, construction of the exhibits, hiring and training neighborhood interpretive guides, putting on events in conjunction with the show. 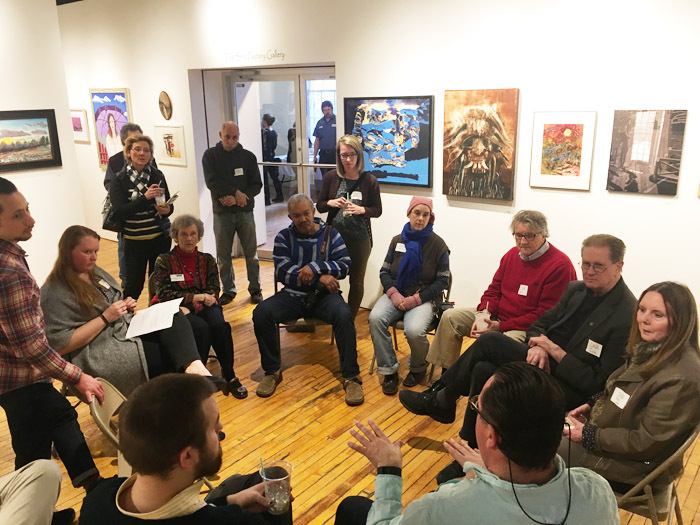 Earlier this month, on April 5, ACE held its freelancers gathering at the Shirt Factory in Glens Falls. The event included time to socialize and network, as well as breakout guided discussion circles, this time on the topic of project management. About 40 people attended, locals but also several, Ms. Sager noted, from closer to Albany. The first such event came about when their research showed as many as 14,000 creative arts freelancers in the region. “We should throw a party for them,” Ms. Sager said they decided. “We thought we’d get a dozen or two people, and then 150 showed up. They were thrilled to be there, exchanging business cards, talking about their issues” — in that case, taxes. 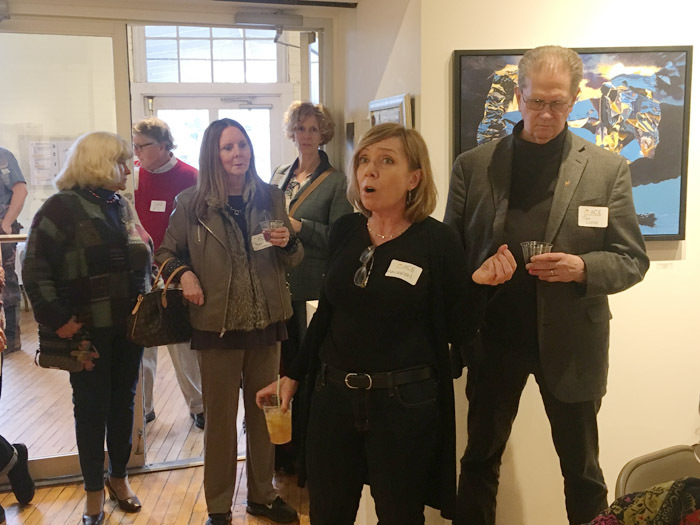 In March, ACE brought its “Inside Business” series to tour Adirondack Studios, “to show that side of the creative industries,” Ms. Sager said. Ms. Sager asserts, “this is all still very new. I invite your readers to send ideas for how we can better include Washington and Warren Counties. The next Spark Freelancer event is this Wednesday, May 3, from 5:30 to 7:30 p.m. at The Albany Barn, an artists incubator of studios and residences. Send input to Ms. Sager at maureen@upstateace.org. Find other upcoming events and more about ACE online at UpstateACE.org. Copyright © 2017 Lone Oak Publishing Co., Inc. All Rights Reserved.